The position of mast cells on the frontline of defense against pathogens suggests they may also play an important role in fostering the host-microbiota relationship. Evidence is emerging that different non-pathogenic bacteria can utilize distinct mechanisms to suppress mast cell function, acting locally though direct interaction with the mast cell at mucosal sites or attenuating systemic mast cell dependent responses, likely through indirect signalling mechanisms. To determine the influence of diverse non-pathogenic/symbiotic microbes, microbial components and metabolites on mast cell phenotype and function. To determine the signaling pathways underlying the functional effects of microbes on mast cells. To identify novel mast cell receptors involved in inter-kingdom communication. 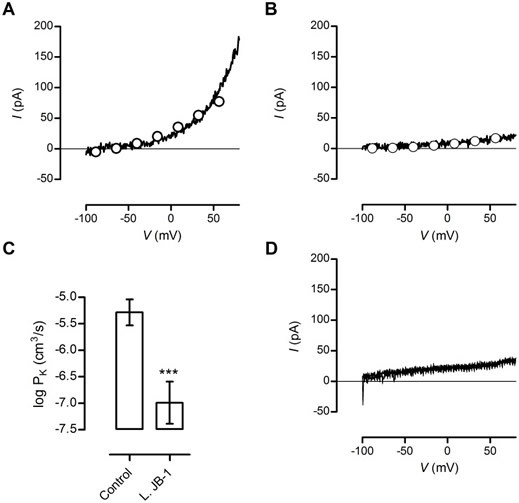 Current – voltage relations for DCEBIO evoked currents in mast cells from L.rhamnosus JB-1 fed or control animals. A) I–V plots of DCEBIO current recorded from mast cell of control animals. The current was fitted with the GHK equation (O) and PK for this cell was determined to be 5.1×10−6 cm3/s. B) DCEBIO current recorded from mast cell of L.rhamnosus JB-1 fed animal was substantially smaller than that from control animals. For this representative cell PK = 1.3×10−7 cm3/s. C) Summary data for DCEBIO current experiments given as mean ± SEM. Feeding L.rhamnosus JB-1 instead of culture medium substantially blocked the DCEBIO current (P = 0.0001). D) Two superimposed traces of I-V plots, the first was performed only Krebs buffer as the perfusate and the second was made when 1 µM DCEBIO was added in the presence of 5 µM TRAM-34. DCEBIO had no effect in the presence of the IKCa channel blocker TRAM-34, cells were obtained from at least 4 animals in each treatment group, *** = p<0.001. From: Forsythe et al. PLoS One. 2012; 7(7): e41234.